Founded in 1975, TEMPO Milwaukee is a professional networking organization for Milwaukee businesswomen in senior leadership, C-Suite and executive-level roles. The typical TEMPO Milwaukee member is a senior leader within her company/organization with at least five years of experience in a senior-level role. Members are highly active in the community, serving in leadership roles on boards, committees, etc. TEMPO Milwaukee’s 350+ members join the organization for leadership, networking and mentoring opportunities among their peer group - women who have reached or will soon reach the pinnacle of their careers. Learn more about our membership here. TEMPO Milwaukee members interested in nominating a female leader for membership must do so by emailing the TEMPO Milwaukee office at [email protected], noting the nominee's name and providing a few details including employer, title and a LinkedIn profile or current resume. A membership committee member will contact you to learn more about your nominee's qualifications and the impact she will have as a TEMPO Milwaukee member. This information is then taken back to the full membership committee for discussion and a decision. New members will be selected on a quarterly basis, the first Wednesdays of April, July, October and January. Is your nominee a better fit for TEMPO Milwaukee or Emerging Women Leaders? Compare the criteria for TEMPO Milwaukee and Emerging Women Leaders here. 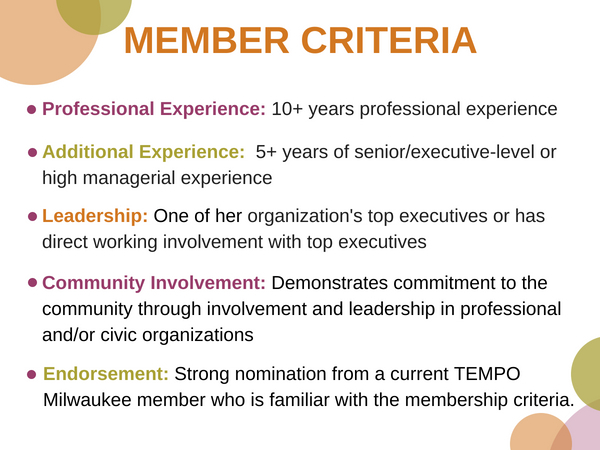 If you meet the criteria below and would like to be considered for membership, but do not know a TEMPO Milwaukee member, please contact the office at [email protected] or 414-301-6680 for further information. If you do not yet meet the criteria for TEMPO Milwaukee membership, consider the Emerging Women Leaders program.